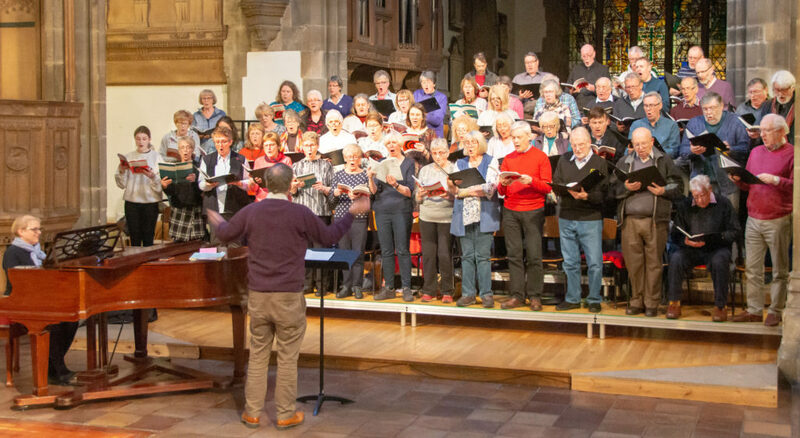 On Saturday 30th March, the Bishopwearmouth Choral Society, conducted by David Murray, performed at Sunderland Minster. The evening marked another important milestone for the choir who are celebrating their seventieth anniversary and this performance of ‘The Creation’ by Joseph Haydn was a reprise of their first concert given in March 1949. “On Saturday evening Bishopwearmouth Choral Society, conducted by David Murray, performed Haydn’s masterpiece, ‘The Creation’, written between 1797 and 1798. During the evening, listeners might have been forgiven for thinking they’d been transported back two hundred years to the first performance in Austria in 1799, such was the quality of the performance. The orchestra presented the opening orchestral prelude, entitled ‘Representation of Chaos’, weaving their way successfully through the depiction of the nothingness that existed before the beginning of time. Throughout the performance this orchestra and chorus very effectively created an empty canvas onto which the rest of the images of the whole of Creation are painted throughout the piece. Between them Timothy Dickinson as Raphael, the chorus and orchestra created a wonderful state of suspense before the collective smile that broke out amongst the audience at the words, “and there was light”. Soloists Timothy Dickinson, and Jorge Navarro Colorado, as Uriel, brought awe and wonder to the piece. Their stately telling of the story, their masterful control of dynamic and stylistic phrasing, coupled with the similarly controlled choral and orchestral sonorities, Laurie Ashworth as Gabriel was quite outstanding. Her virtuosity and exquisite control of the high notes was spectacular. Her second aria, ‘With Verdure Clad’ was a thing of beauty with the clarity of her voice and attention to musical detail a joy to behold. Special mention must go to flautists Margaret Borthwick, Brian Stewart and Jill Hughes and clarinetists, Jennifer Murray and Andrew Smith, bassoonists Robin Kennard and Sharon Clatworthy who, in an ensemble of such quality, managed to stand out. They played complex flourished cadenzas and scales which were pristine, crisp and clear. Arias showed the soloists and the woodwind in perfect harmonious union. Often church acoustics lose the details at the back of the hall but on this occasion every detail could be heard which is testament to the conductor, David Murray, who had clearly paid great attention to how the piece would, and should, be heard. This entry was posted on Monday, April 1st, 2019 at 11:15 am	and is filed under News.